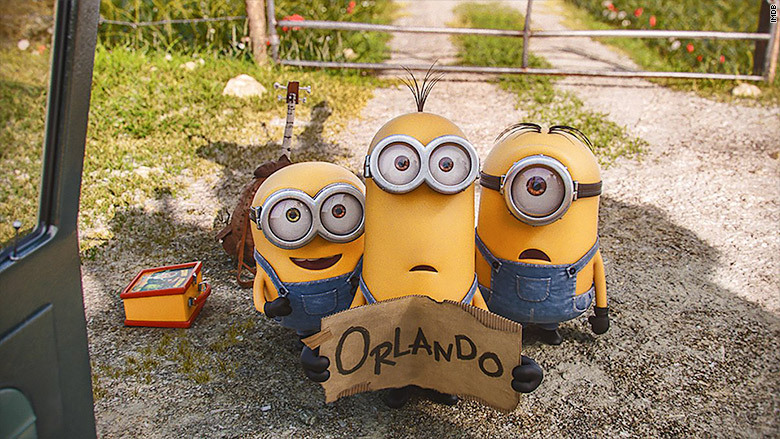 The small creatures from "Minions" had a big weekend at the box office. The animated film jibber-jabbered its way to an estimated $115.2 million opening in the U.S. this weekend, giving "Minions" the second-biggest animated opening of all time. It beat out classics like 2010's "Toy Story 3" and was just short of the record holder, "Shrek The Third," which debuted in the U.S. to $121.6 million in 2007. The film's big weekend is even more surprising considering that the Minions debuted as side characters in the 2010 Universal and Illumination Entertainment film "Despicable Me," and "Minions" is a stand-alone prequel of sorts starring the gibberish-speaking characters. However, a mixture of good marketing and timing helped put the little monsters at the top of the box-office heap. "'Minions' may be small in stature, but they leave a massive box-office footprint," said Paul Dergarabedian, a box office analyst for Rentrak (RENT). "Great marketing, a perfect release date and multiple high-profile product tie-ins made this a guaranteed hit and perhaps one of the most perfectly realized movie spin-offs ever." Universal's marketing push for "Minions" was a big one that had the yellow characters showing up everywhere from toys at McDonald's to Amazon delivery boxes. Universal's other monster movie, "Jurassic World," continues to have some roar, pulling in an estimated $18.1 million in the U.S. this weekend to add to its already massive $590.6 million North American total. The other big animated film released this summer, Disney and Pixar's "Inside Out," also had a strong weekend with an estimated $17.1 million. The Pixar film about a young girl coping with the emotions of a life-changing event has brought in $435.4 million globally since opening in mid-June. This weekend's overall box office was up roughly 40% from the same time last year, and it hopes to keep that momentum going with Disney and Marvel's "Ant Man" hitting theaters next weekend.